Experience all that Australia has to offer, on a 18 day custom adventure of a lifetime! For the opportunity to appreciate the natural beauty from every perspective, exploer Melbourne and Sydney, visit the magnificent Ayers Rock, discover a majestic underwater world, drifting through the turquoise waters of the Great Barrier Reef. Your journey will guide you on an unforgettable tour of the barren desert landscapes, lush tropical forests and pristine beaches. Encounter the wildlife, embark on unique excursions and learn about the rich history and local culture along the way. So, pack your bags and have your camera ready to capture the memories...Australia awaits! Melbourne is perhaps best characterized as Sydney's young, artsy, hip sister. Intricate, multicultural, intense art covers many walls in this colorful city, and locals are fiercely proud of their home's artistic streak. Like all the coolest cities, Melbourne's urban center is divided into small neighborhoods, and wandering three blocks brings one new vibe after another. There's always a street festival to wander through, an art exhibit to appreciate, or a coffee tasting to sit in on. The university and the city's sports teams are ingrained into the culture as well, so expect a young, enthusiastic local crowd cheering at a football or cricket match. Enjoy the convenience of a designated driver, as you are whisked off to the Yarra Valley today! Come thirsty, as your tour affords you the opportunity to visit four exceptional wineries, each with a unique story and exquisite wines. Your day will kick off with a private, behind the scenes barrel tasting at the boutique winery, Dominique Portet. At Oakridge Wines, you will enjoy a mouthwatering two-course lunch, overlooking the soft green rolling hills from their open terrace. 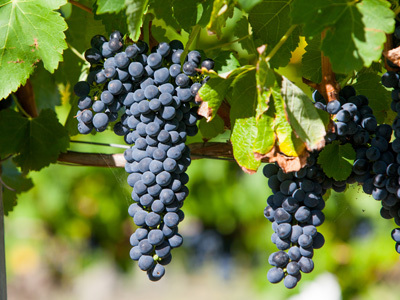 At Coldstream Hills, founded by famous wine critic James Halliday, you will taste their impressive Pinot Noir and Chardonnay. And finally, onto Yering Station, with its gleaming, light-filled cellar door, to taste award-winning wines and satisfy all of your senses. At it's old farmhouse-style produce store, you can purchase some tasty accompaniments as well. At the end of a delicious day, you will be taken back to your hotel. 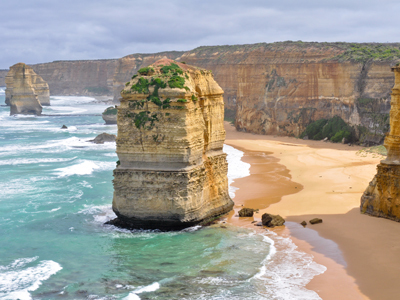 You will be picked up at your hotel today, to embark on a tour of the Great Ocean Road. Experience this majestic coastal drive in style, with time to relax and fully appreciate the wonders of this world famous route. Stay on the lookout for some fascinating wildlife sightings, that include whales, dolphins, echidnas and bandicoots. Your camera won't experience a single dull moment along this exciting itinerary, that offers endless photo opportunities. Hugging one of the world's most famous harbours, and defined by its two iconic structures, the Sydney Opera House and the Sydney Harbour Bridge, Australia's capital is instantly recognizable. But for a city that is so defined by a building though, its people sure do love spending time outdoors. From surfing, to hiking and just hanging in a park, it's the city's active population that gives it real life. There are always new restaurants to try, a different hiking trail to hit, and a sea of excitable locals down for a pint. Sydney is a true modern metropolis, and happy people form all over the world seem to funnel here, and the result is one of our favorite cities in the world. Today's nature exploration and wildlife discovery tour takes place in the heart of the Blue Mountains World Heritage Region. From lush temperate rainforests, to towering sandstone escarpments, you will have the chance to see it all. Alongside a knowledgeable guide and small group of other travelers, you will venture outside the city center, and escape to a wonderland of sandstone outcrops, deep ravines and hazy blue eucalyptus forests. Following in the footsteps of your guide, you will be led off the beaten track to remote lookout locations, as you discuss the history, flora and fauna of this magnificent region. The first stop of the day will be Euroka Clearing, located deep in the National Park. Admire the abundant bird life of this area that is also home to wild kangaroos. Enjoy a break for morning tea, coffee and local treats, before ascending the Blue Mountains towards the majestic viewpoints of the Jamison Valley. Your guide will make sure to take you to the least crowded areas, so that you can make the most of this experience. One of these hidden secrets, the Eaglehawk Lookout, features beautiful views of the famous Three Sisters. The character of the Three Sisters changes throughout the day and throughout the seasons, as the sunlight showcases a magnificent variety of colors. As you take photos, your guide will discuss the legends behind this attraction. offers the best of the Red Centre distilled into four magical hours. An evening of dining under the sparkling outback sky. Known colloquially as Ayers Rock, Uluru has kept travelers enticed for years, coming from all over the world to admire its impressive size and history. It is a spiritually significant attraction to the local Anangu people, which you will quickly understand for yourself. From the enchanting pink hues at sunrise, to the creeping shadows of the afternoon and the majestic shades of orange at sunset, this rock feels very much like a living thing. 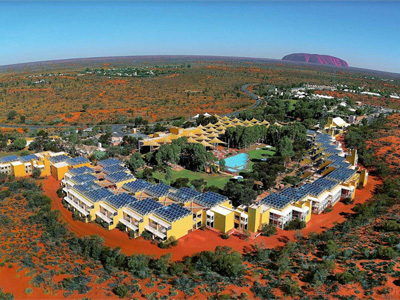 In order to accommodate visitors, a variety of resorts have sprouted around Uluru, ranging from quick stop motels, to five star luxury spas. 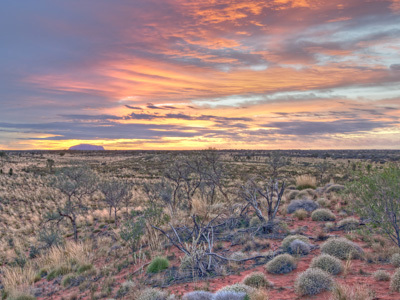 Today you will travel towards Uluru and enjoy as its vast shape rises from the sand dunes in the early dawn light highlighting its presence in this country. Your guide will take you to a special location to watch the sun rise over this amazing monolith. You will learn the creation stories of Liru (poisonous snake) and Kuniya (python) and hear about the Mala people. After breakfast you will visit Mutitjulu Waterhole and then drive around the base of the Uluru before returning to the resort. 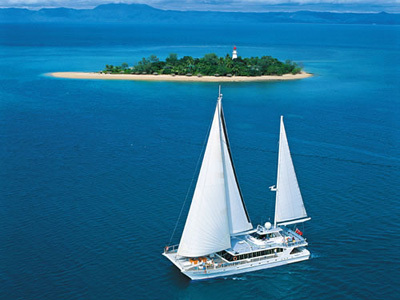 Today you will enjoy a catamaran cruise to Low Isles. Today you will be picked up at your accommodations in Port Douglas and transfer to the Silky Oaks Lodge. Nestled on the edge of the Mossman Gorge in the Daintree Rainforest, Silky Oaks Lodge is the Daintree's ultimate resort where this rare wilderness can be enjoyed in elegance and ease. The Lodge itself overlooks the Mossman River and is a perfect base to explore the Tropical North Queensland region. Your stay at Silky Oak includes 2 nights accommodation in a Garden Treehouse, full gourmet breakfast daily, two course dinner for both evenings in the Treehouse Restaurant, afternoon tea for two in the Jungle Perch, and Kuku Yalanji Dreamtime guided walk through Mossman Gorge including transfers. Today you will be met by your private driver and transferred to the airport for your departing flight. We hope you enjoyed your experience and we wish you a pleasant flight home. Easy living is the mantra at Ovolo Laneways, a super-central modern design den with all the extras you'll need thrown in – from free WiFi to minibar treats and Apple TV. Spacious rooms and bespoke street art give the interiors attitude; outdoors, the city's laneway secrets beckon, with stylish wining and dining just a stroll away. Located within the heart of the Central Business District, steps away from Parliament house and the Treasury Gardens , Ovolo Hotel Melbourne offers its guests effortless living without being away from the action that our amazing city has to offer. 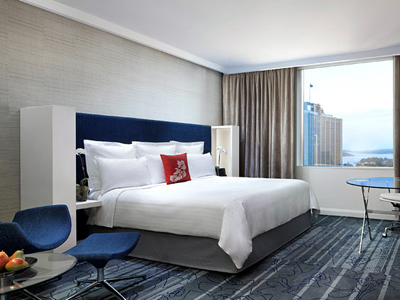 Location, location, location: The Sydney Harbor Marriott Hotel at Circular Quay boasts the best there is. Perfectly situated overlooking the gorgeous Sydney Harbor and national landmark, the Sydney Opera House, our Circular Quay hotel is mere steps from the historic Rocks District and world-class shopping. Spend your day sightseeing, then return to our five-star Marriott Sydney hotel for much-deserved pampering in our spa. Satisfy your inner foodie at our beloved onsite restaurant, Icons Brasserie, sip on a carefully crafted cocktail or well-poured pint at Customs House Bar, or indulge in a coffee at Macquarie Lounge. Find a restorative respite in our Circular Quay hotel's immaculately appointed rooms, offering luxe amenities and awe-inspiring harbor views. Reserve your stay at one of travelers' favorite Sydney Harbor hotels online easily, and start daydreaming about your harbor view hotel stay today. Enjoy true 5-star comfort and service at the heart of Australia's red center by staying at Sails in the Desert. Located close to Uluru-Kata Tjuta National Park, the resort takes its name from the white sails on its roof and is part of the Ayers Rock Resort complex. Featuring luxurious rooms and suites, stylishly decorated with Aboriginal art, a gallery in the lobby, and significant artworks featured throughout the public areas and in the private rooms, the property is complimented by essential modern conveniences. Guests can relax with a drink under the sails, dine at one of the three restaurants, and also have access to the complex's bars. Sails in the Desert eagerly awaits your visit. The Peninsula Boutique Hotel offers apartment style accommodation. Located beachside and offering the perfect Port Douglas stay in a quiet, peaceful oasis; A retreat for the discerning holiday maker looking for comfort and luxury combined with the friendliness and personal service only a small hotel can provide... with no traffic noise it is just perfect for couples and singles looking for an adult haven. This unique style of accommodation in Port Douglas is most sought after and combines both hotel services with the benefits of self catering apartments. Nestled on the edge of the Mossman Gorge in the Daintree Rainforest, Silky Oaks Lodge is the Daintree's ultimate resort where this rare wilderness can be enjoyed in elegance and ease. The Lodge itself overlooks the Mossman River and is a perfect base to explore the Tropical North Queensland region. With Port Douglas only 20 minutes away, the morning drop off and afternoon pick ups provide opportunities to explore the many boutiques, restaurants and shops of this coastal town. You can cruise along the Daintree River and visit the Great Barrier Reef or Cape Tribulation - all within easy reach of Silky Oaks Lodge. This is just one of many authentic travel experiences offered by Global Basecamps. 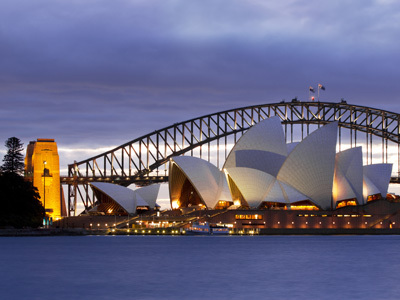 If you are interested in more unique destinations to Australia with unprecedented planning and extraordinary service visit our main Australia tours page to browse other sample trips.